I’m in Dallas Texas right now, perhaps the most opposite place thank Toyko where I’ve been the last week, and have been avidly sharing my observations via Twitter, the following are some of these observations, as well as a bit more context beyond 140 characters. These observations are more of a personal and cultural note, rather than my field report that focuses on the business aspect of social media in Japan. Internet Adoption high in Japan: I met the top executive of a marketing company in Japan and he told me that 2/3 of Japan’s 120 million residents are on the web. Yet most Japanese corporations do not invest heavily in web: This executive also told me that only half of Japan’s 4000 companies spend more than $100k on the internet at all. Credit crunch discussed: This is a global issue, I heard it in a few meetings with clients, it’s cascaded beyond US. Facebook’s Japanese Translation Poor: I asked my Japanese clients what they thought of Facebook’s translation, they looked away, grimaced, and gave very clear body reactions that it needs improvement. I promised to pass the word on, as I speak to Facebook on a frequent basis. Tokyo’s adoption of Twitter highest in globe: Given the heavy mobile adoption, I’m not surprised by these stats. Developer and Enterpreneurs not fully gelled: There’s a gap (cultural and language) between business entrepreneurs in web scene and the web engineers and developers, mentioned one web entrepreneur now based in Tokyo. In silicon valley, it feels like one family. Anonymous trolls hurt in real life: It was mentioned in conversations a few times that comments –esp anon ones –can really damage someone’s reputation, honor. This south Korean actress was pushed over the edge and committed suicide. Police light handed with foreigners: A UK tourist decided to swim in the moat of Tokyo’s Imperial Palace –naked. This is considered taboo, insulting, and just humiliating. Apparently, if a native did this, they would be severely punished. Hotel Life: My room is equipped with a plasma screen, cordless iron, toilet with a bidet, and a futon like firm mattress. Pride in workmanship: Everyone takes pride in their work and the customers they serve. Many taxi drivers have white glove service, and I noticed idling taxi drivers polishing their vehicle while waiting for next fare. A far cry from NY cabbies. Also, they will open and close the door for you using a remote lever –so dont open or close taxi doors, it’s frowned upon. Tipping not required yet service high: Tipping isn’t part of Asian culture, in fact, it could be seen as insulting. Despite this, service was extremely high from taxis fast food, to hotel staff. If the weather was bad, expect apologies from Japanese, a most polite and considerate culture. I question why I feel forced to tip at American restaurants for mediocre or even sub-standard service. Pandora: It works in Japan, I’m pleasantly surprised as I thought it was North American only. Corporate Responsibility motto a current trend: Like “Green computing” in US, many Japanese corporations are on the sustainable and giving back to the community bandwagon, in fact, this makes a ripe opportunity for social media efforts to help tell this story. Salary Men: Are Japan’s corporate worker, in the area I stayed, there were many dressed in black or gray suits, often with a skinny tie. Work life takes priority over anything else, and long days can extend to 12 hours, then not including after work eating, drinking, and festivities. Apparently, it’s not unheard of many salarymen to stay the night in small hotels, or even utilize showers at work… I thought I worked a lot. Fresh Sushi: I had ‘real’ sushi near the fish market. It was more like FRUIT, than fish. Firm, burst in your mouth and sweet, I don’t think it was frozen. Vending Machines: Dispense not only drinks and smokes, but also you can pay for food before you enter noodle houses, this increase effeciency, and reduced need to fumble with money and change. Salary Men hung out near vending machines where beer was dispensed in late evening –I wanted to join them. Crime rate low: I noticed cops have batons, but not guns. Crime rate here is significantly lower than US. Upon closer look some had smaller guns, 22s? Much different than larger guns US cops carry. Tokyo Travels: Went to Roppongi which has many ex-pats, as well as a somewhat nefarious hidden underground. Mobile Medium: No SMS, yet all phones are 3G, most phones have built in digital TV tuners, so you can watch TV in crystal clear quality. Developer Community still growing, yet not unified: Developers complexities with developing software, as they are a hardware based culture. Shibuya is the technology center –esp high tech and startups in Tokyo. Kris Tate, CTO of zooomr.com a photo sharing site notices an increase from 7-715, then later from 8pm-1am. Both are before and after work, often accessing from home computers before hitting the subways. There’s isn’t a large blogging community in Japan to help be the ‘instant niche media’ that you’d find in the US. Been to Japan? What have you observed? Above Image: Social Technographics of Japan’s Online Consumers, this data (and more) is accessible from the Groundswell Profile tool. First of all, this isn’t formal research, it’s just a one week observation from an outsider who spoke to a variety of companies and experts at a blogger dinner. For ongoing commentary and dedicated research from a true expert, meet colleague Jonathan Browne who’s a Forrester analyst focused on Customer Experience and based in Tokyo –he has far more knowledge, experience, and research on Japan than I likely ever will. I’m here for one week speaking to some of Japan’s top companies about my research on communities and social technologies, as well as keynoting Japan’s ZDnet conference on social technologies and speaking to press and media. I soaked in as much Japanese culture as I could, and make a lot of observations and comparisons on twitter. Everywhere I look I see process and technology efficiencies that improve Japan’s environment. Every minute detail has been thought out, in order to ensure the country works well together and is efficient in day to day operations. Riding a 100+ MPH bullet train to Osaka confirms that only a few countries can develop and put into action a transportation system so effective. Yet despite the high adoption and leadership of technology (esp mobile) in Japan, some locals expressed to me that technology optimism within Japan is actually very low. Some expressed to me that individuals are less social in real life as they tend to communicate via mobile devices. Yet despite the advances in technology from any country, it’s important to note the impact of culture on social media. In fact, social media marketing is more like psychology or sociology than it is about marketing –in fact, technology is just a trigger point –and not much more. I’m told that Japan’s group think culture can cause pressure that gives individuals a desire for self-expression. These tools can enable just that, and I’ve learned that many Japanese have multiple profiles to allow them to traverse in public, with friends, or speak their mind anonymously. Looking at the graph at the top of this post, this confirms my observations. It’s interesting to note that ‘creators’ in United States are 21% compared to 35% in Japan, also, both countries have about equal number of ‘spectators’ both more than 2/3rds. In a culture where mobile usage is extremely high, accessing the web at any time is a fingers’ reach, this may explain why the ‘spectator’ behavior is so high. I expect social media adoption to continue to increase among citizens, consumers, and the public, yet we’re still a few years off from seeing a mass movement of corporations adopt these tools, unless there are some ‘punkings’ that spur corporations out of hesitation and start to react then be proactive. I heard case studies of companies like Nissan and Sanyo using social technologies to reach customers, but although I can’t confirm it, some blogging initiatives don’t enable comments. Even with that said, experience shows that successful social media efforts require corporations to truly be transparent resulting in the rich history of Japanese corporate culture to change. I spoke with bloggers, corporations and colleagues and confirmed that Japan’s top down management approach make it difficult for a Groundswell to be accepted within corporations. Furthermore, senior leadership may be removed from being adopters of these new technology –furthering the understanding gap. Although all brands are fearful of failure and risk, within Japanese corporations this resonates even louder. The ‘fail quickly and iterate’ mentality of silicon valley isn’t a virtue shared within Japan’s long time pillars of business. At my keynote at Tokyo’s Zdnet event, I presented my findings from my recent research report on the “Best and Worst of Social Network Marketing” I could visible see the attendees get uncomfortable as I outlined the many companies who had ‘failed’ my test. Despite the unpleasant feeling, it was important that the attendees see who did it wrong –then right, so their chances of success increase. Perhaps the first place to look for corporate adoption isn’t within the marketing and PR departments, but within the internal enterprise. I met with a few companies who expressed that internal usage of communities and social networks are already underway. Given the strength of the Japanese culture that can act collectively (although may be more top down than bottom up) the opportunity for group think collaboration may be high. I’m echoing what Johnathan Browne has posted, read his full post to get more context. Q&A: What is the Japanese equivalent of [Western web service]?. Find out which websites are popular in US and they’re counterparts in Japan. Japanese more likely to search for term “wiki” but does it reflect adoption? Cathy shares her observations of some of Japan’s web services: What can you add to this? Terry White attended one of my presentations, and comments on how a focus on people –not technology will prevail. I have so much to share about my trip to Japan and meeting with dozens of people from Japan’s top companies, and over 20 bloggers and social media experts at last night’s blogger dinner. The following portion is updated the day after the blogger dinner. Last night’s blogger dinner with Tokyo’s finest was interesting, aside from meeting the movers and shakers in this space, discussed the social web and it’s impact on culture, we had a fun time enjoying food and drinks. 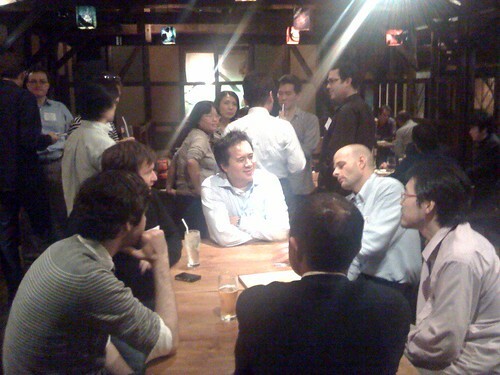 I encouraged the attendees not to socialize but to also think about how social technologies impact culture, business, and Japan, we had some very interesting discussions, and the viewpoints from many of the ex-pats were often similar to the Japanese. I met some of the social media evangelists at large Japanese companies, as well as entrepreneurs, professional bloggers, and local VCs. As I tried to circulate to many of the different tables, I started to hear patterns in the discussions. I asked folks to think about the adoption of these tools (this graph aboves shows a high degree of consumption by ‘spectators’) yet I quickly learned that many corporations are not participating with these tools, there’s just a handful of companies using these tools in public (Nissan, Sanyo, and several are conducting buzz marketing efforts). I’m still formulating my thoughts on why this is the case and what can be done –but I want to loop back with Jonathan Browne, Forrester’s expert on Japanese Customer Experience to bounce of him as a sounding board –more to come on this topic soon. I’m excited to meet Tokyo’s top bloggers at a community blogger dinner, I’m cruising through many of the attendees blogs before the event, sadly, about half of them I’m unable to read –gotta learn Japanese. Here’s the lineup for tonight, quite a few ex-pats. Social Media Marketing: This one, I really wish I could read. If I missed anyone, leave a comment, I’ll add you in. I’ll add my notes and pictures to this post later. While we’re all connected by bits and bytes, there’s nothing like meeting people in real life, I’ve met bloggers all over the world, you can see the archives, I’ll be adding to this over the years, it’s a great journey.